The early Miner Wars 2081 alpha I played last year was little more than a spaceship equipped with a mining laser capable of blasting tunnels through massive asteroids. I played with it for hours. Since then the Descent-inspired space sim has grown into something much bigger. On the most basic level Miner Wars 2081 is a space sim that takes several cues from the classic Descent series, one of the last great bastions of interstellar combat in a genre that doesn't get enough play these days. Descent was known for its six-degrees-of-freedom navigation — players could move in any direction on any axis. Coupled with a first-person cockpit view this made for a dizzying spectacle, introducing many players to the concept of motion sickness. Miner Wars 2081 takes that same gameplay and adds a unique twist: completely destructible environments. 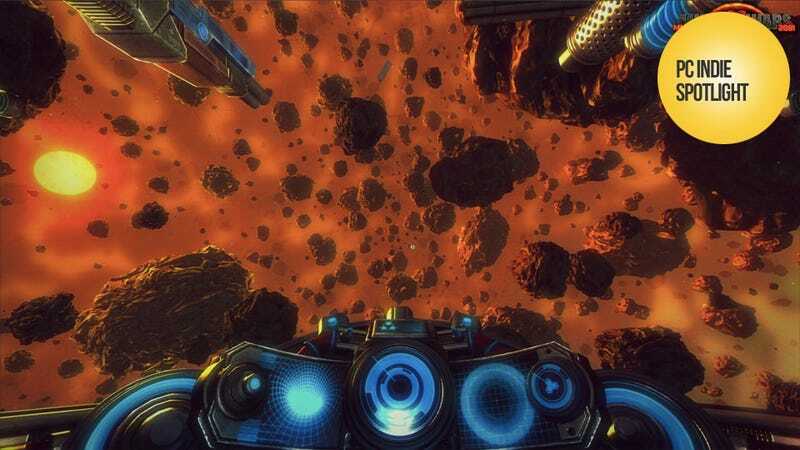 Utilizing the voxel-powered VRAGE engine, the titular miners in Miner Wars 2081 can burrow through asteroids, creating paths where no paths existed before. Digging through tons of beautifully rendered rock is strangely exciting. There's just something about tunneling through tons of stone with no way of knowing where you'll come out or what awaits you on the other side. While I could spend all day digging, there's an actual game here as well. A game with many scripted missions to play through by yourself or with the aid of a hired friend. A compelling game made even more so by the fact that the enemies you face will have to figure out how to deal the constant changing of the structures they inhabit. It's not a game that's all about destruction, however. Players can also create their own unique sectors utilizing the power of voxels and a simple editing tool. Build asteroids up from nothing. Hollow them out to create a hideaway for your secret base. Connect pieces together to build massive, fully navigable structures. Or just screw around. Create say, a skull out of a non-diggable material, cover it with rocks, and let friends stop by and chisel it away to find the prize inside. I'm expecting amazing things from the Miner Wars 2081 community. And even better, six months after the official release of Miner Wars 2081, developer Keen Software House plans to release Miner Wars MMO, a persistent-world version of the game where thousands of players can create and destroy to their hearts' content. Miner Wars 2081 has so much potential it makes me tingle just thinking about it. At worst we'll wind up with a solid modern version of Descent. At best we'll have a massive space sim on our hands with more than enough gameplay to keep us going until someone else realizes how badly this genre needs to revivification.